Picard starts to jump around in time, back to when the Enterprise launched and 25 years into the future. Q is responsible for the jumping — and seems to reconvene the trial from “Encounter at Farpoint” — which somehow relates to an anomaly in the Neutral Zone. Past Picard must convince the new Enterprise crew of his decision to defy orders and take the ship to investigate the anomaly. Present Picard (naturally) has the loyalty of his crew, but Future Picard is an old man who’s slowly losing his mind. He must convince his former senior staff — who have all lost touch — to rejoin and find the anomaly. When they all find it, they learn it was actually caused by a specialized scan looking for the anomaly in all three time periods, a paradox Picard realizes in a key moment. The three ships work together — with Picard coordinating in all three timelines — and collapse the anomaly, but all three ships are destroyed. Then, Q (apparently) reverses everything, as Picard passed the test when he recognized the paradox to show that he was capable of real growth. 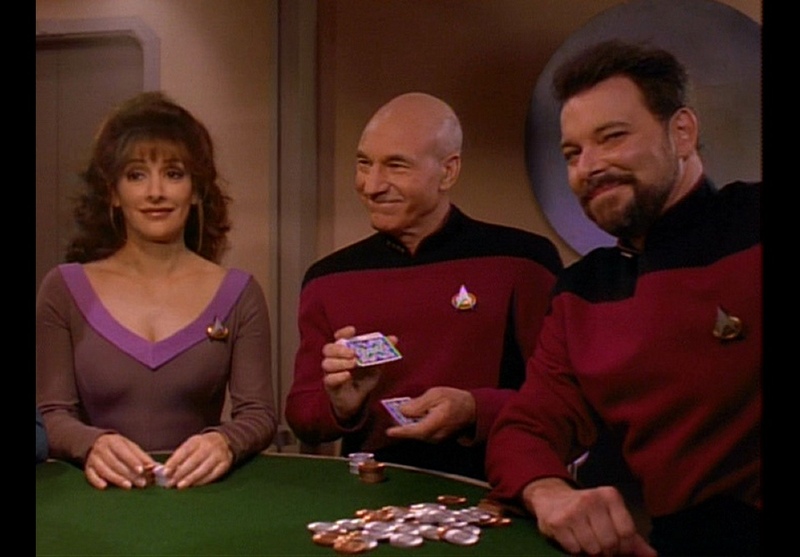 Back on the ship in present day, Picard joins the senior staff during their poker game for the first time — with the idea that the crew now won’t grow apart — and the Enterprise-D goes off into the sunset. Picard, essentially, saves the human race in this episode. So, he’s got that going for him (which is nice). Beyond that, this is a finale — and we plan to review every TRUE series premier and series finale (“Turnabout Intruder” being the last episode of TOS but not a true finale). The ending of this episode has always made me pause. I guess the idea is that Picard saved humanity and that Q reversed the destruction of the three Enterprises because Picard passed the test. But, then, was humanity ever really in danger, or was the whole ordeal one of Q’s illusions? It doesn’t matter THAT much, I guess. If the anomaly and what happened to Picard were part of an illusion, the Q Continuum could have wiped out humanity for not passing the test. Bigger picture, I’ve always thought “All Good Things … ” was overrated. It’s just SO full of technobabble and there are some clear editing/writing mistakes. I also didn’t really buy that the crew would have drifted so far apart. If nothing else, Geordi and Data would have kept in touch more. Meanwhile, this episode is the culmination of one of the dumbest things Trek ever did — pairing up Worf and Troi. The relationship had been hinted at earlier in the season, but we never saw the two of them doing much of anything (other than alt-reality stuff) until the TNG finale. The idea that Troi would be able to deal with a Klingon who is rather rough in the sack — based on everything we saw in the first six seasons of TNG and on DS9 — never made even a little bit of sense. It required making Worf much too human. As noted in other reviews, the seventh season of TNG is really pretty odd — and the Troi/Worf stuff is a prime reason why. It might be the most prime example, actually. Oh, and what the hell happened to the Romulans in this episode? Picard gets them to agree to send one ship to investigate the anomaly — but it never shows up! Finally, while it’s cool to see the Enterprise just prior to “Encounter at Farpoint”, a LOT of the details are off — beyond the fact that the actors clearly looked a lot older. O’Brien — who was barely in “Encounter at Farpoint” and didn’t have a name for another full season — is retconned into being a big player on the ship. Beyond that, it’s weird that Data — who was second in command of the ship, as Riker hadn’t been picked up yet — wasn’t in the shuttle bay to greet Picard and didn’t attend the staff meeting after Picard called for red alert. Is the idea that Picard promoted him to the senior staff on the way to Farpoint? 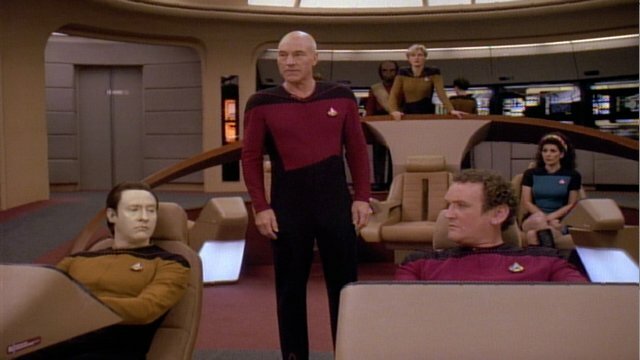 The pips on Data’s collar were wrong in this episode, as they show him as being a second lieutenant and not a lieutenant commander. 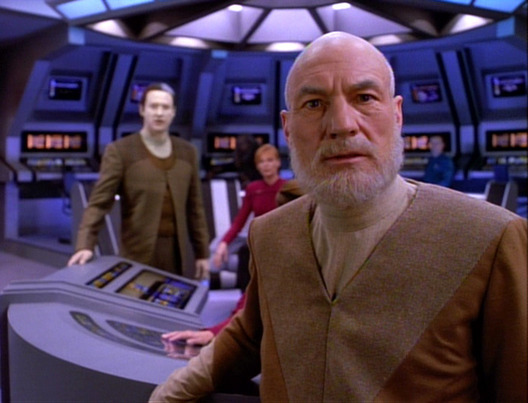 At one point, with Data on the bridge, Picard apparently leaves Yar in command, which would mean Yar outranked Data. Taking a look at the possible futures of the characters was fun. The Crusher/Picard pairing that we saw in the seventh season apparently culminated in them getting hitched and subsequently divorced. I never really liked that Picard would end up being with Crusher in late TNG — it ran counter to a lot of what we saw about Picard’s stance on romance with the crew — but it at least wasn’t as stupid and pointless as the Troi/Worf stuff. We tell you which episodes you should watch that we don’t think are part of the tapestry, and we mention one that we really should have reviewed on its own.